It’s that spooky time of year once again, with pumpkins and cobwebs as far as the eye can see. This year, [Mikeasaurus] has put together something really special – a Ghost Rider costume with some amazing effects. The costume starts with the skull mask, which started with a model from Thingiverse. Conveniently, the model was already set up to be 3D printed in separate pieces. [Mike] further modified the design by cutting out the middle to make it wearable. The mask was printed in low resolution and then assembled. [Mike] didn’t worry too much about making things perfect early on, as the final finish involved plenty of sanding and putty to get the surface just right. To complete the spooky look, the skull got a lick of ivory paint and a distressed finish with some diluted black acrylic. With the visual components complete, [Mike] turned his attention to the effects. Light is courtesy of a series of self-blinking LEDs, fitted inside the mask to give the eye sockets a menacing orange glow. However, the pièce de résistance is the smoke effect, courtesy of a powerful e-cigarette device and an aquarium pump. At 225W, and filled with vegetable glycerine, this combination produces thick clouds of smoke which emanate from the back of the wearer’s jacket and within the skull itself. Truly stunning. Okay, now we think [James] is just on a mission to see what he can build using the dollar store as his parts bin. 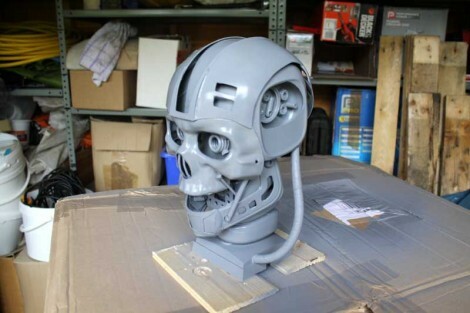 This is the nearly finished replica of the cyborg skeleton from the Terminator franchise. It’s made mostly from things that cost $0.99. Actually we’ve got that a bit wrong. [James] is really shopping at the £0.99 store but the concept is basically the same. He’s already shown us that he’s a pro at this with the arc reactor replica we recently saw from him. This time around a set of speakers donate their enclosures to build up the spinal column supporting the skull. Fittingly these are glued together using a hot glue gun from the store. The sides of the skull are carefully crafted from a set of four plastic bowls. The jaw comes together thanks to the corners of a plastic box’s lid. And finally the majority of the face is from a golden skull costume mask. Spray it all grey and pop in some LEDs for the eyes and he’s done it! He show’s off his final creation in the video after the break.